Are the school summer holidays just too long? Barbara Ellen: Francis, I would always have argued that school holidays are too long. For parents, that is. A case of: “My child, I would fight a lion for you, but if you ask me to play another game of Connect 4, I may have to suffocate myself with Moon Sand.” Now, with Michael Gove proposing shorter breaks for free schools, the feeling is growing that school holidays are too long for children, too. Leastways underprivileged children, who hold their own during the academic term but fall behind every summer because they miss out on the stimulation and structure better-off parents are able to provide throughout the holidays. It’s disadvantage piled upon disadvantage – how is this fair? Francis Gilbert: Barbara, the summer holidays are the great gift of liberty that we give to our children – and curmudgeonly parents and politicians deprive children of their liberty at their peril. The summer hols are a prolonged period in which our children can find out who they really are and really be themselves – without the restrictive rules and regulations of school to confine them. Yes, I concede your point that we know that poorer children can suffer a “dip” in their academic performance over the summer, but this issue is much more complex than it first appears. In some boroughs, such as Tower Hamlets, where I live, the poorest children’s academic performance has actually significantly improved in recent years for a number of reasons, one of which has been the improved provision that the borough has provided during the summer holidays. Activities such as tennis, canoeing, trips away and film-making are all now offered free of charge during this time. The point is that the activities are voluntary. I firmly believe that giving children this choice about what to do really helps them establish a firmer sense of identity and autonomy. Poorer children have benefited massively. Let’s help all areas provide this wealth of activities that raise aspirations rather than locking children up in school all summer. BE: While I applaud the efforts of Tower Hamlets, sadly this is not the norm nationally. As a rule, disadvantaged families must fill the weeks by themselves, and cash-poor, time-poor parents cannot provide tennis, film-making or canoeing. Which is why, as borne out by US research from as far back as 1968, poorer children fall behind during the holiday period, while the better‑off thrive, both academically and in terms of hinterland. As for children “really being themselves… without restrictive rules and regulations”, this may have been true of our summers, but does anyone allow children to wander free and unregulated any more? In the 21st century, parents (or carers) are omnipresent. Times have changed, shouldn’t school holidays? FG: I’m glad that we’re both agreed that it’s vitally important to raise the aspirations and achievements of our poorest children but I’m not convinced that shortening the summer holiday is the answer. The reasons why children from poor backgrounds do badly at school are complex; social, economic, psychological and educational factors all play a role. Pinning the blame on summer holidays is facile. It’s also worth pointing out that 80% of our children are not living in poverty. Are you saying that they too should be staying at school longer, despite the fact that they all want to keep the summer holidays as they are? 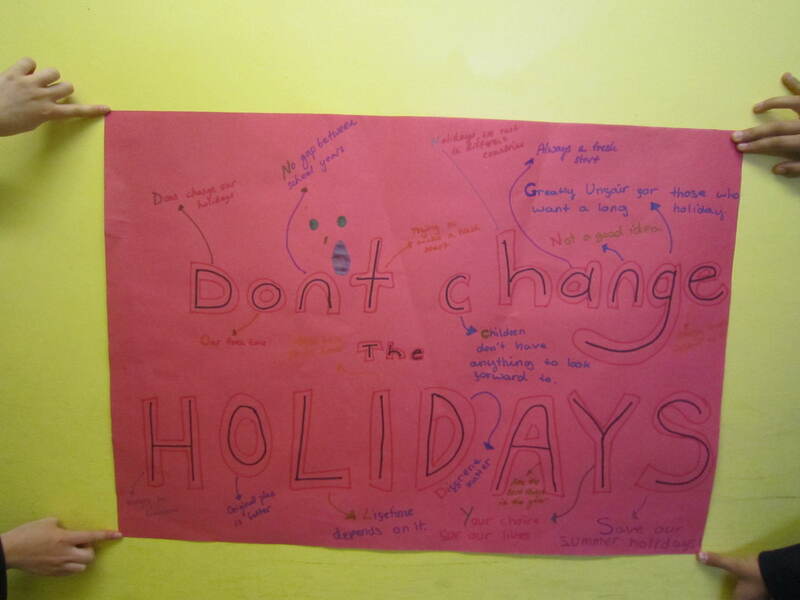 Indeed, when I discussed the issue with my pupils – rich and poor – they were so incensed by the notion that their freedom would be curtailed that they made some “protest” posters in response, saying things such as they would have nothing to look forward to during term-time and that shorter holidays would make them unhappier. 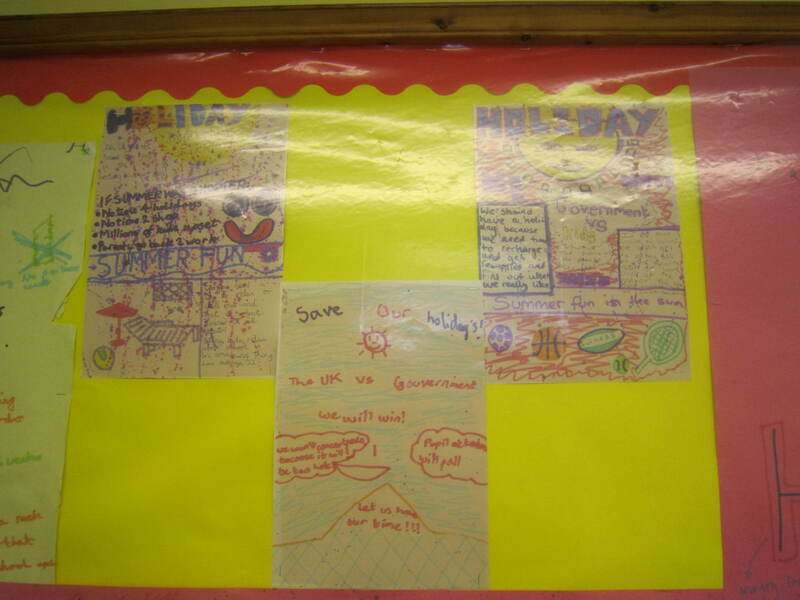 BE: Francis, well done to your pupils for their posters, and their spirited defence of summer freedoms. However, it’s all a question of framing. Children may feel “free” in summer, and that’s great for them, but for many parents, the overlong holidays are a headache and an expense. Not only are you supposed to provide non-stop entertainment for weeks on end, now it seems there must also be an element of “home-schooling” and “self improvement”, lest your child be one of those who fall behind. Isn’t this the government backing away from the problem as if it’s nothing to do with them? The expected result would be the more moneyed parents running around, keeping up with the tutoring, extra-reading, rural walks, library visits, chosen sports, et al. Meanwhile the stressed poorer parent hasn’t the time or the cash to compete. These parents are unable to add what amounts to “education-lite” or “holistic boost” to their summer “to do” list. So, unless you’re lucky enough to be in a borough such as Tower Hamlets, the poorer families have no chance. I agree that there are many complex ingrained and toxic reasons why poorer children fare less well at school, and these need addressing with great urgency. I also sympathise with schoolchildren and of course their overworked teachers, who are desperate for the respite of the long summer holidays. Then again, “Hard cheds!” as we used to say in my comp playground. Just because something has always happened one way, it doesn’t mean it’s always going to be the best way. A problem has been identified, and if there’s a chance that amending it would hugely benefit underprivileged kids, removing just some of the hurdles they face, then shouldn’t we at least give it a go? FG: Barbara, we’re really getting to the root of the matter here because your response ultimately raises a crucial question: what are the respective roles of parents and teachers in this modern, high-octane society? As a teacher, I do think that many parents need to stop panicking about being bad parents. Your list of things that parents should be doing with their children is depressing because underlying it is the notion that parents should be “instructing” their children – that they should be surrogate teachers – rather than providing the love and attention that our children desperately need. It’s actually abdication of responsibility because many parents substitute activities for love. That’s enough; the summer holidays are a great time to chill out, no matter how rich or poor you are. Leave the teaching to the teachers. 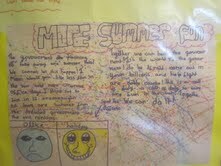 After the hols, I get my pupils to write a letter to me telling me about themselves and what they’ve done in the summer. Having done this for nearly 20 years, I can predict the life-chances of my pupils not by how “hot-housed” they’ve been, but by how happy they seem in their letter. The happiest children speak about enjoying the supposedly mundane things in life with their families: going shopping, cooking dinner, tidying up even! Their letters glow with love. I agree with you, that school holidays should be kept as they are. Both my children are at Primary state school, so I don’t know if I would be saying the same if they had the two month+ holidays that private school children have, but at the moment, six weeks seems just about right. I love the idea that they can be a bit ferrel, and be free from the restraints of homework, piano lessons, timetables and all that goes with it. It also gives me a break from that same routine. Two weeks at Christmas, never seems quite enough, as they are exhausted from the long autumn term. Easter feels about right, and six weeks at summer is perfect. I am in the position to be able to send them to a drama week this week – etc. and to go away too, but in my borough Hammersmith and Fulham I have noticed that there is a wide range of free provision for children during the holidays, if you just look – also schemes at the libaries etc. and free or heavily discounted swimming lessons at the local pool. I am sure there are boroughs apart from Tower Hamlets who will provide this kind of service.